A DAY that showcased Dublin’s year one progress under Mattie Kenny – but also the journey yet to travel if they’re to match Limerick’s All-Ireland benchmark. This afternoon’s first Allianz Hurling League semi-final was in the Nowlan Park melting pot at half-time, Limerick leading by 0-10 to 0-9. Even with the benefits of the second half breeze, John Kiely’s men still only led by the minimum (0-13 to 0-12) as a low-scoring third quarter drew to a conclusion. But then Peter Casey’s 52nd minute point kickstarted an unanswered Limerick salvo of 1-5 as their underdog opponents succumbed to a turbo-charged spell that effectively killed the contest. Limerick already looked to have one foot in their first NHL final since 2006 before substitute Séamus Flanagan struck a superlative 61st minute goal. It had its genesis in a probing long delivery from the excellent Diarmuid Byrnes; Cian Lynch’s catch was followed by the deftest of cross-field assists to the inrushing Flanagan, who fired past Alan Nolan. Byrnes eased Limerick nine clear soon after, but then Ronan Hayes' catch and batted finish provided Dublin with a 64th minute goal and some encouragement down the home straight. Even though Lynch riposted with a point, that would prove their last score and Dublin rattled off the last four points to shave Limerick’s winning margin to three. Earlier, it had proven a bittersweet first half for the challengers. On the positive side, they matched Limerick stride for stride – and almost point for point. The sides were level on seven occasions before Aaron Gillane’s goal chance on the turn, deep in stoppage time, flew over to give the All-Ireland champions a 0-10 to 0-9 lead. Far less positive for Mattie Kenny was the attritional nature of that opening stanza. By the 25th minute he had already lost four players to injury – top scorer Oisin O’Rorke, followed quickly by Daire Gray (to a blood injury that kept him off the field until half-time), Seán Treacy and Riain McBride. All Star Graeme Mulcahy was Limerick’s menace-in-chief, his razor-sharp shift decorated by 0-3 from play before the break. Yet Danny Sutcliffe and Eamon Dillon were equally influential for the Dubs. Dillon’s pace and directness yielded a first-quarter brace and he also drew a couple of frees, one of which was converted by early sub Paul Ryan. Meanwhile, two of Sutcliffe’s three first half points arrived in the first three minutes while his third, brilliantly taken from the right wing, followed an inspirational drive out of defence by Eoghan O’Donnell. That left a wind-assisted Dublin, playing once more in their darker shade of blue, one point clear. 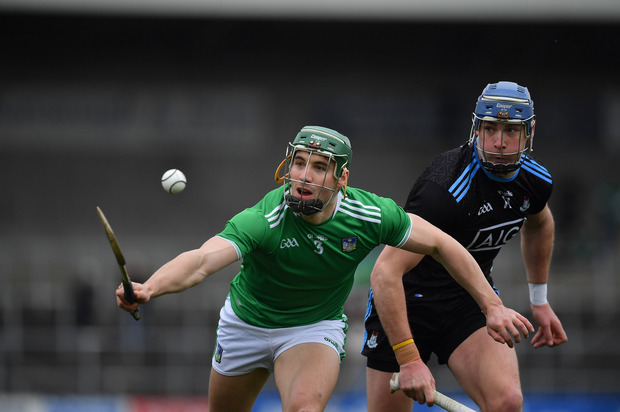 But Limerick finished the half more strongly with points from Gearóid Hegarty and Gillane, the latter created by Kyle Hayes’ powerful surge at the heart of Dublin’s defence. SCORERS - Limerick: A Gillane (3f), D Byrnes (4f) 0-5 each, G Mulcahy 0-3, S Flanagan 1-0, D O’Donovan 0-2, T Morrissey, G Hegarty, P Casey, C Lynch 0-1 each. Dublin: P Ryan 0-6f, D Sutcliffe, E Dillon 0-3 each, R Hayes 1-0, T Connolly, D Treacy, S Moran (f), C Crummey 0-1 each. LIMERICK: N Quaid; T Condon, S Finn, R English; D Byrnes, D Morrissey, P O’Loughlin; C Lynch, D O’Donovan; G Hegarty, K Hayes, T Morrissey; A Gillane, P Casey, G Mulcahy. Subs: D Dempsey for T Morrissey (53), S Flanagan for Mulcahy (55), C Boylan for Hegarty (59), M Casey for Condon (65), B Murphy for Hayes (66). DUBLIN: A Nolan; D O’Connell, E O’Donnell, P Smyth; C Crummey, S Moran, S Barrett; D Gray, S Treacy; C Boland, D Sutcliffe, E Dillon; R McBride, J Hetherton, O O’Rorke. Subs: P Ryan for O’Rorke (inj 11), T Connolly for Gray (blood 14-ht), F Whitely for Treacy (inj 21), J Malone for McBride (inj 25), R Hayes for Hetherton (43), D Treacy for Boland (51).